Carbon monoxide detectors and smoke detectors both share the same goal – that is to help save people’s lives by providing early warnings when harmful air pollutants are detected. Where they differ, however, is the kind of pollutants they are designed to detect, and how they detect them. Smoke detectors are used to detect smoke and provide early warnings in the event of a fire. This is especially important considering most fire-related deaths are caused by smoke inhalation rather than by the flames themselves. Alarms on the smoke detectors alert people to the presence of fire, so they have enough time to escape to safety. Generally speaking, smoke detectors can work in two ways. The first makes use of light sensors that trigger the device’s alarm when they are obstructed by smoke particles. This is known as photoelectric detection. The second method makes use of internal electric currents that when disrupted or obstructed by smoke particles, trigger the alarm. This method of detection is known as ionization detection. Some smoke detectors make use of a combination of both methods for more reliable and accurate detection. Additionally, some newer models even make use of heat sensors that help detect fires by identifying unusual increases in temperature. These detectors are used to help detect and warn people when they pick up a potentially dangerous amount of carbon monoxide in the air. Unlike smoke, carbon monoxide is much more difficult to detect as it is not visible. Additionally, as it is an odourless substance detection can be difficult without the proper equipment. Exposure to this substance can be dangerous and potentially lethal. Inhaling carbon monoxide can leave you feeling dizzy, nauseous, light-headed, and short of breath. Prolonged exposure may eventually lead to loss of consciousness and even death. Many household appliances such as gas boilers, water heating systems, cookers etc. make use of carbon monoxide. Thus, any leakages or malfunctions in these devices can result in carbon monoxide leaking into the surrounding air. These detectors help detect carbon monoxide in one of three ways. The first makes use of a gel that changes colour when exposed to carbon monoxide. Sensors detect the colour change and then trigger the alarm. The second makes use of silica within its circuits. Silica is sensitive to carbon monoxide and the electrical current then gets lowered when it detects this substance, thereby triggering the alarm. The final method of carbon monoxide detection makes use of electrodes that are placed in chemical solutions that change when exposed to carbon monoxide. Like smoke detectors, some carbon monoxide detectors make use of a combination of these methods for more accurate detection. Deciding when to use smoke and carbon monoxide detectors depends on many different things. Carbon monoxide detectors are not always necessary especially in environments that have little to no risk of carbon monoxide leakages. Smoke detectors, on the other hand, are usually much more important as almost any house or building has a certain degree of fire risk. Some countries even legally require certain homes and businesses to install and make use of smoke detectors. 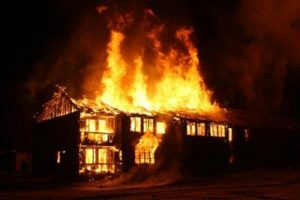 Smoke detectors are especially important in buildings that are built from flammable materials such as wood. Additionally, buildings that make use of extensive electrical systems and wiring should place smoke detectors in high-risk areas. Carbon monoxide detectors can be useful as an extra precautionary step, but can also be somewhat redundant at times depending on the surrounding environment and potential risk of carbon monoxide exposure. As a result, it is not necessary for every home or business to make use of carbon monoxide detectors. Using a combination of smoke and carbon monoxide detectors can add an extra layer of protection against both types of air pollutants. In some cases, insurance companies even offer discounted premiums for buildings fitted with these detectors. Both smoke and carbon monoxide detectors should be placed in areas that are within hearing range. For example, placing a smoke or carbon monoxide detector far away from your bedroom might not be helpful at night when you are sleeping, as you may not be able to hear it. These detectors should also be placed in high-risk areas such as the kitchen or fireplace, and near water boilers and heaters etc. This will help maximise their efficiency and increase your house/building’s safety. Additionally, these devices should be placed on the ceilings of your house/building as both smoke and carbon monoxide rise, and are more easily detected when the devices are situated on ceilings. Smoke detectors, and to a somewhat lesser extent carbon monoxide detectors, can be vitally important devices within the modern world. These devices help save lives and allow people to sleep better at night knowing that their safety is being monitored and assured.